With TourMyCountry.com, I try to find original views on Austria and would like to encourage my readers to walk off the beaten track. One attraction of Vienna that is widely neglected by the vast majority of the Austria guidebooks that I have seen is the Donauturm Tower. This radio signal transmission tower is the highest building of Vienna and offers quite amazing views over the city, yet most guidebooks seem to ignore it completely. Nonetheless, it ranks at place 8 of the most heavily visited sightseeing attractions in Vienna - due to domestic visitors. For a good reason: The characteristic building was designed by the architect Hannes Lintl and built under the supervision of Eberhard Födisch. The construction was done upon the occasion of the "International Garden Show" of Vienna that took place in 1964. Do not ask me what exactly a radio transmission tower has to do with horticulture and gardening, but now that it's there, it is great to have it. It was built within the exhibition's venue, the Donaupark ("Danube Park"). 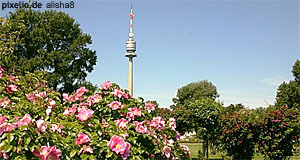 The Donauturm Tower carries antennas of mobile phone networks, private VHF radio stations and a couple of other radio communication services. Surprisingly, it is not used for the transmission of television signals - despite of its similarity with other towers (such as the much higher CN tower in Toronto or other TV towers) that are primarily used for TV transmission. View from the Donauturm - more impressive if experienced live. The Donauturm tower is 252 metres high. During the "Donauturm-Lauf" race you can do a macho thing and climb all 779 stairs to get to the platform at 150 metres. On normal days you can take an elevator. The elevators take approximately 35 seconds. Running up and down the stairs as it happens during the Donauturm Lauf could possible take a little longer. The platform is not the highest accessible spot, though, since there is a two-storey restaurant that rotates at 160 and 170 metres. The adventurous ones among you should go during the summer, when a bungee jumping service is provided from the platform. Getting to the Donauturm Tower is easy via the subway and a nice option for a few quite moments in the midst of busy sightseeing. It is located in the 22nd district, the Donaustadt.